Doesn&apos;t it seem that when company is in town you go to places you had always been intending to go? We&apos;ve been wanting to try Chen&apos;s Asian Restaurant ever since it opened about six or so months ago in Carlisle (they&apos;re at 310 N. Hanover Street). You see, we had always enjoyed Chen&apos;s King Buffet on E. High Street and were sad to see it close, so we have been very curious to see how things would be at Chen&apos;s new restaurant. My husband&apos;s brother and family are in town visiting this week, so along with both of our moms and our daughter, nine of us headed in to Chen&apos;s last night for dinner. As soon as you enter, a really cool water wall greets you, and if you think to look up, there is a beautiful chandelier in the entry. The restaurant is quite nicely furnished. Definitely a spot for a nice date night, or a casual lunch or evening with friends. They serve Chinese, Japanese, Thai, Sushi... the menu is HUGE!! (There is no buffet at Chen&apos;s new restaurant, but there is a sushi bar!) After perusing the menu for a bit, we decided that in addition to hot tea and an egg roll for each of us, we would choose 7 different entrees to share. The best part is, in addition to being quite tasty, it&apos;s very well priced! You won&apos;t go broke even with a large party like we had. I have to admit, when I was there I wasn&apos;t thinking about blogging or I would have paid more attention to the details in order to share with you all. So... you&apos;ll have to go check them out yourselves! You won&apos;t be sorry. :) They&apos;re open seven days a week lunch through dinner. 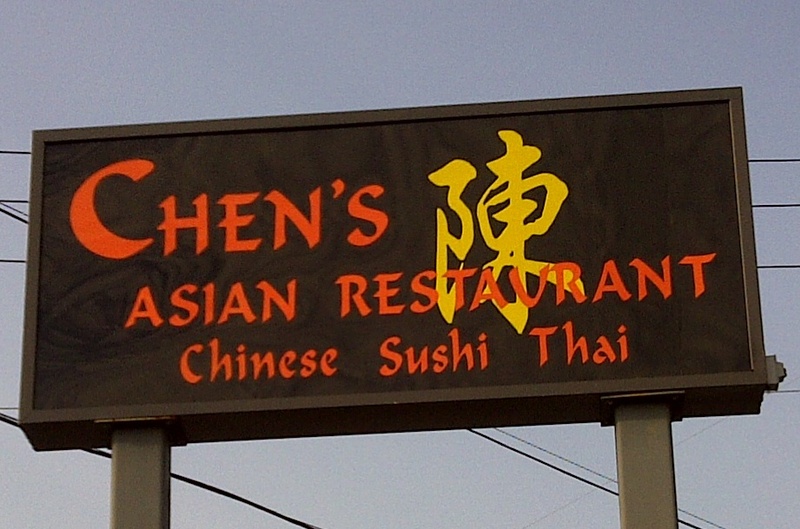 We definitely hope to visit Chen&apos;s again. Or maybe we&apos;ll call ahead to pick up some take-out from time to time.